Working with vitamins B6 and folic acid, B12 crucially contributes to normal homocysteine metabolism. Most B-complexes do not contain higher levels of the B vitamins. 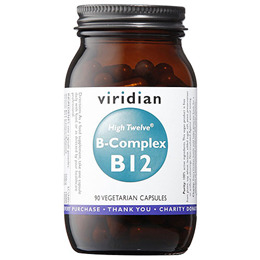 Viridian High Twelve B12 Complex includes Vitamin B12 at 500mcg (ug) together with Vitamin B6 at 20mg and folic acid at 200mcg (ug), together with all the other B vitamins. Vitamin B12 (Adenosylcobalamin), Vitamin B12 (Methylcobalamin), Vitamin B5 (as Calcium Pantothenate), Vitamin B3 (as Niacinamide), Vitamin B6 (Pyridoxine HCL), Vitamin B2 (Riboflavin), Vitamin B1 (Thiamin HCL), Choline (Bitartrate), Inositol. Biotin, Folic Acid, In a base of alfalfa, spirulina and bilberry, Vegan Capsule. Below are reviews of Viridian High Twelve Vitamin B12 with B-Complex - 90 Vegicaps by bodykind customers. If you have tried this product we'd love to hear what you think so please leave a review. 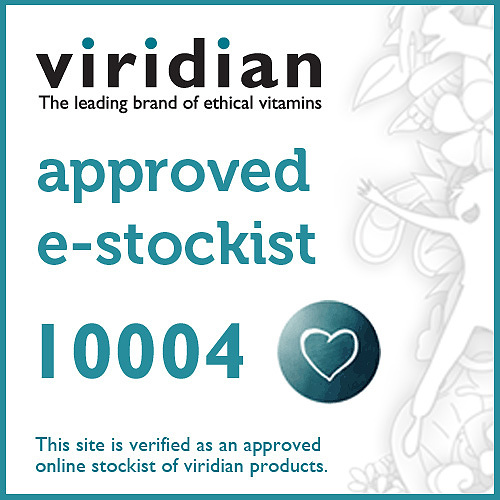 Viridian High Twelve B12 Complex features higher levels of cyano and methyl cobalamin (vitamin B12). Vitamin B12 supports the normal functioning of the nervous system, an energy-yielding metabolism, psychological function, immune system and red blood cell formation.